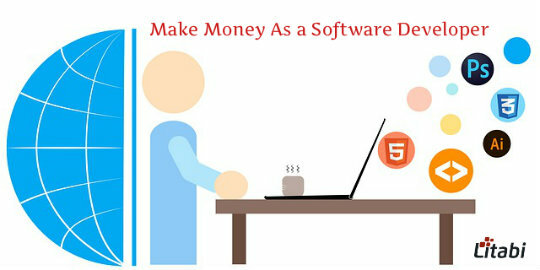 Home » Business » How To Make More Money As A Software Developer? Software development isn’t really the easiest jobs in the world as there will always be a fluctuation in between your paychecks. This as to do with the fact that people will react differently to the software you put out based not just on key characteristics but also on elements such as the time of the year in which you release it. That’s not to say that software developers aren’t able to win a more than a decent paycheck. It’s quite the contrary, as a successful app on its own can be quite lucrative, not to mention the opportunities and doors it opens for future projects. The quality of the app also plays a crucial part here, as there is no point in looking for ways in which you can earn more from developing software if you don’t meet the prime requirement: the app must be of high quality. That being said, let’s see the three ways in which you can earn more from software development skills. It might be seen as a bad move from an ego perspective but you need to understand right off the bat that there will always be things you haven’t mastered in the same way others have. This means that you can always get invaluable advice from experienced people in the fields. Taking your project to a company like Vironit.com that has the experience and on-hand specialists to properly examine and adapt to a fluctuating market can prove to be the missing key to an overall powerful and efficient app release. If you’ve only considered going about it the traditional way in which people can download the software in exchange for a fee, or even worse, have decided to just release it for free, you might be about to lose a lot of money. There are multiple ways in which both customers and developers can be happy about how an app. Offering an app for free is not a very good idea from a marketing perspective but if you add the freemium element to it, things change. Freemium refers to the concept of offering an app for free only in appearance as the insides are hosting lucrative micro transactions. Micro transactions are represented by small in-app purchases that give you access to additional features and also helps you skip steps in different processes by paying. This is a very popular method of earning money off of software. The best way to ensure that people are buying an app or any piece of software is to make sure that first and foremost they know of its existence. People can’t buy what’s not there, and you need to make sure they know your app is there. That being said, you should not be cheap about investing resources into marketing. Regardless of how you go about marketing, it will generate excitement and awareness for the product and this makes it crucial elements in selling more and making more money overall off of software. As the job security and health benefits for the software career, people are getting reduced these days, it is a wise option to look for some better earning opportunities at the spare time. I hope that the tips discussed in this post would help you earn some bucks with your software development skills. You may also start a software training institute and develop the app for the e-commerce industry to earn as a software developer.